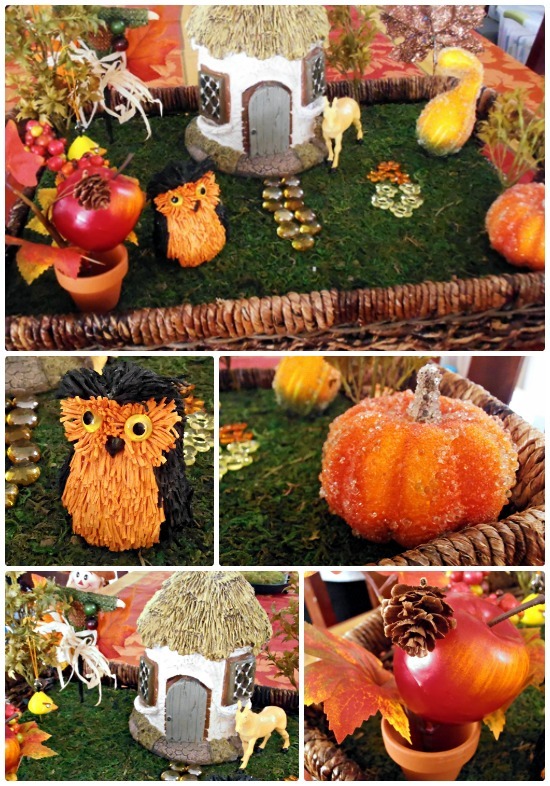 A few weeks back my daughter updated her indoor fairy garden to have a fall theme. This was actually before she had a Halloween theme, but I hadn't gotten around to posting the pictures till now. If you haven't seen this before, basically an oversized somewhat shallow basket is used for a container, which is filled with a large piece of styrofoam cut to fit. We hot glued a large piece of moss onto the styrofoam and let it set up and dry, then added the decor. There are no fairies in this old picture because after a Summer of playing, the original fairies all broke and we have replaced them. The fairy garden was just changed out again to have a Christmas theme. What can I say, we are excited for Christmas!